Lenovo takes entertainment seriously and this year, the company launched new entertainment-packed smartphones particularly designed for multimedia-savvy users keen on winding down after a long hard day at work. So if you’re looking for a better work-life balance this 2017, why not try Lenovo smartphones, which pack in productivity and an immersive cinematic experience like no other in one nifty form factor? Equipped with Lenovo's built-in TheatreMax technology, which lets users connect their device to VR Goggles for immersive content viewing, Lenovo Vibe smartphones convert multimedia content into a VR-enabled file, taking users on a reel-to-real adventure. Lenovo Vibe X3 features a 5.5-inch Full HD display with a 178-degree wide viewing angle and Lenovo Screen color optimization for enhanced image quality. Powered by a 64-bit Qualcomm Snapdragon 808 hexa-core processor with 3G RAM and 32GB internal storage, Lenovo Vibe X3 renders HD movies without any glitches even when other applications are simultaneously running. Complementing TheatreMax technology, Lenovo Vibe X3 also sports the new Dolby ATMOS, the world's largest chambered front stereo speakers, for an optimal cinematic experience. Most importantly, Lenovo Vibe X3’s 3600mAh battery ensures that users enjoy quality viewing without interruptions. Bundled with the VR set, screen protector, and back cover, Lenovo Vibe X3 retails at Php22,099 in Lenovo stores nationwide. Lenovo Vibe K4 Note offers the same TheatreMax technology and cinematic experience without burning a hole in your pocket: for only Php8,999, entertainment seekers can watch their favorite movie or TV series on Lenovo Vibe K4 Note's 5.5-inch Full HD display with 178-degree wide viewing angle. Like Lenovo Vibe X3, Lenovo Vibe K4 also comes in front-ported Dolby ATMOS stereo speakers. For users aspiring to produce their own digital content, Lenovo Vibe K4 Note also features a configured 3-mic system and state-of-the-art Wolfson audio codec, an advanced sound input and recording capability that filters out noise while effectively enhancing sound quality. Built to deliver high performance, it runs a 64-bit MediaTek MT6753 octa-core processor and 3GB of RAM. With a 16GB internal storage expandable up to 144GB, Lenovo Vibe K4 Note allows users to keep a huge archive of their favorite movies and shows in their smartphone. Lenovo Vibe K4 Note is available in Matte White and Matte Black colors. Lenovo Vibe K5 Plus and Lenovo Vibe K5 Note are perfect for on-the-go entertainment lovers. With the smartphones’ integrated TheatreMax Controller, users can easily navigate single-handedly and even easily switch modes as necessary. Both smartphones run on the Android 5.1 Lollipop Operating System and are powered by octa-core processors that support high definition movies and smoothly run applications wherever they are. Lenovo Vibe K5 Plus sports a 5-inch Full HD 1080p display while Lenovo Vibe K5 Note has a slightly larger 5.5-inch screen, offering smartphone users a visual treat. Both models feature Dolby ATMOS, front-ported speakers specifically engineered to compliment Lenovo's top-of-the-line entertainment core. To top it all off, Lenovo Vibe K5 Series keeps users well-entertained with a lasting battery life. Pricing for Lenovo Vibe K5 Plus starts at Php8,999, while pricing for Lenovo Vibe K5 Note starts at Php11,999. Lenovo's breakthrough TheatreMax technology has definitely upped the ante in mobile entertainment. 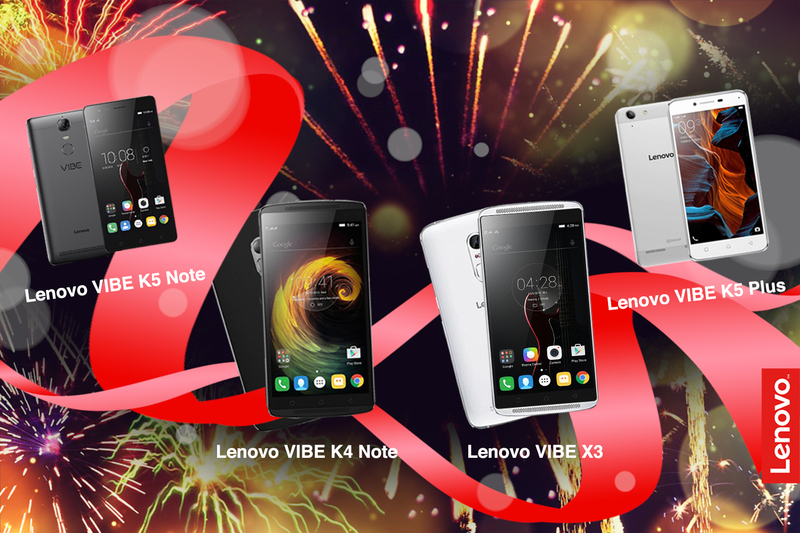 From binge-watching movies and playing favorite games to exploring multimedia applications, users can finally have more reasons to enjoy the New Year, thanks to Lenovo Vibe smartphones.